Approximate weight per package: 1.5 Lb. Deep, rich flavor and tender succulence make drumsticks an all-time favorite. Plus, they're meaty, and they come with their own convenient handle. Fry them, grill them, or simmer them in a deep, rich sauce. There never seem to be enough to satisfy the drumstick lovers in any family. Figure at least two per person and a few more for good measure. 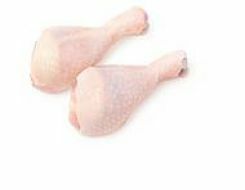 5-6 Drumsticks per package.